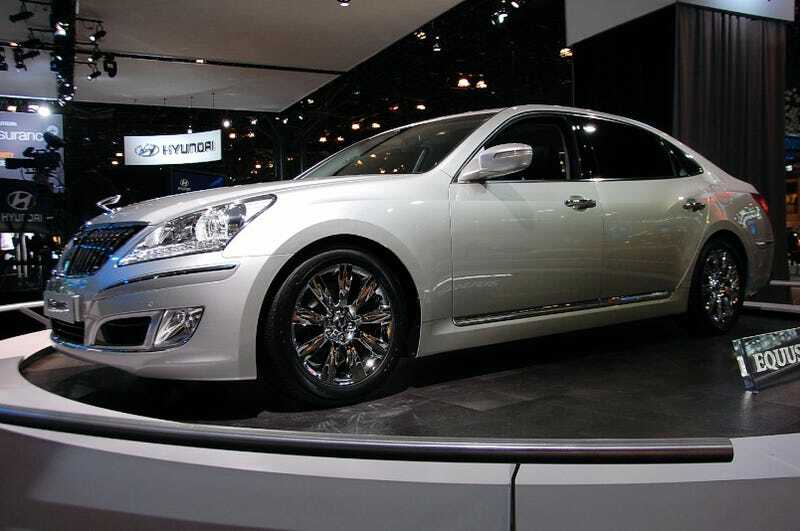 Currently, there aren't plans to bring the executive-level Hyundai Equus super-sedan to the US, but Hyundai trotted one out to the New York Auto Show to judge the reaction to a $100K Korean car. The super horsey from Hyundai made it's North American debut here on the New York Auto Show's carpet as a tease for what Hyundai is capable of in the luxury realm. With a price tag starting at $96,000 it has a lot to answer for. The car gets both the 4.6 liter Tau V8 and a bigger version clocking in at an even 5.0 liters (a homage to another "pony" car?) cooking up around 420 HP. In addition to the big mills, it'll get an 8 speed automatic transmission, Lane Departure Warning System, Vehicle Stability Management System and Pre-Safety Seatbelt System. Inside are all the accommodations one would expect for high-powered Korean businessmen: leather, rear entertainment system, power window shades, little pseudo-iDrive knobs front and back, table trays in the rear, kimchi bar — the works. If interest in the car is high enough, we might be seeing the next Asian luxury import that'll never compete with established luxe brands like Lexus.